Have I told you that I have a girlichef crush? I love that blog and everything she cooks. 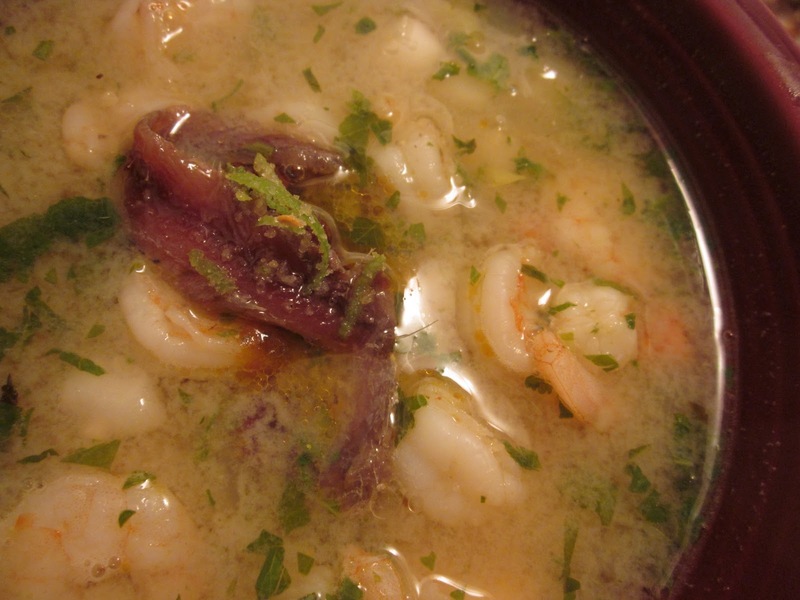 I was intrigued by her recipe for Posole de Camerones last week and decided it would be the perfect New Year's Eve lunch. Of course I used it more as a point of inspiration instead of an actual recipe, making more than a couple of changes. However, I think I stayed true to the flavors. Delicious! Mince everything and set aside. Heat olive oil in a soupot over medium-high heat. Add onion, celery, and carrots and sauté until tender. 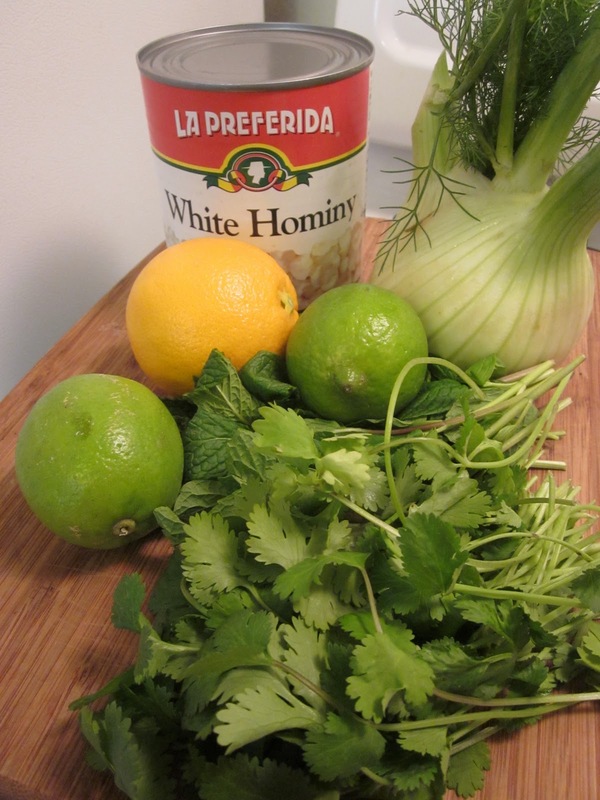 Stir in the reserved Herbed Salsa Verde, vegetable boullion, juice from the orange and bring to a boil. Add shrimp and cook till opaque. To serve, ladle soup into flat bowls. Garnish with sun-dried tomatoes, anchovy filets, and lime salt. 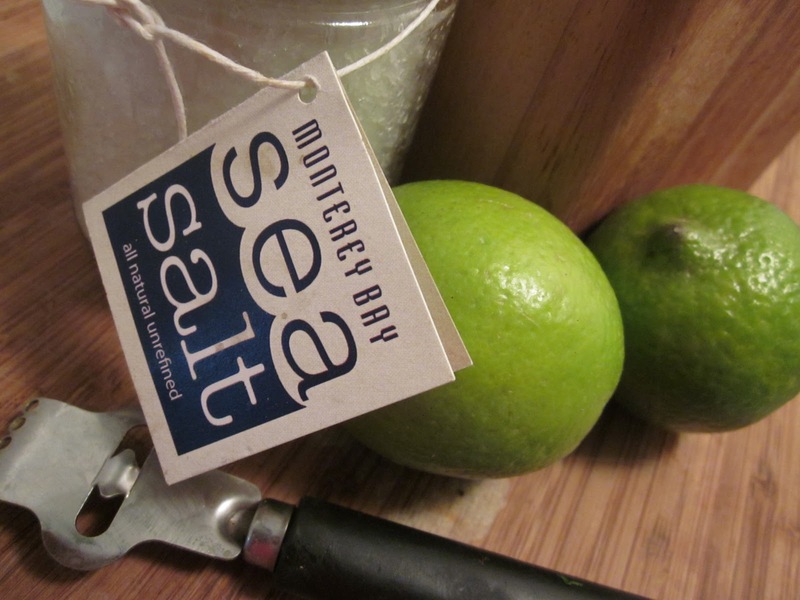 Squeeze fresh limes over the soup. Enjoy! 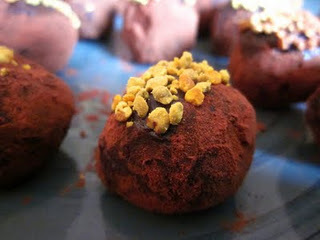 I debated between tamarind truffles, lavender truffles, or bee pollen truffles. 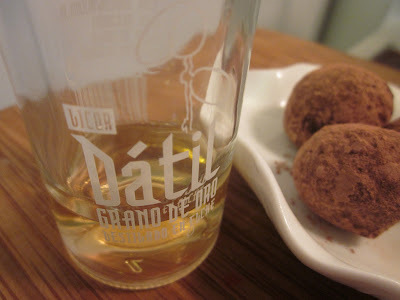 Then I spied the bottle of Datil, a date liqueur that Pia brought back for me from Mallora, in my cupboard. Truffles at midnight. Done deal, baby. In a small, heavy saucepan bring the whipping cream to a simmer. Place the chocolate in a separate bowl with date liqueur and 1/4 t ground cardamom. Pour the cream over the chocolate. Let stand for 3 minutes. 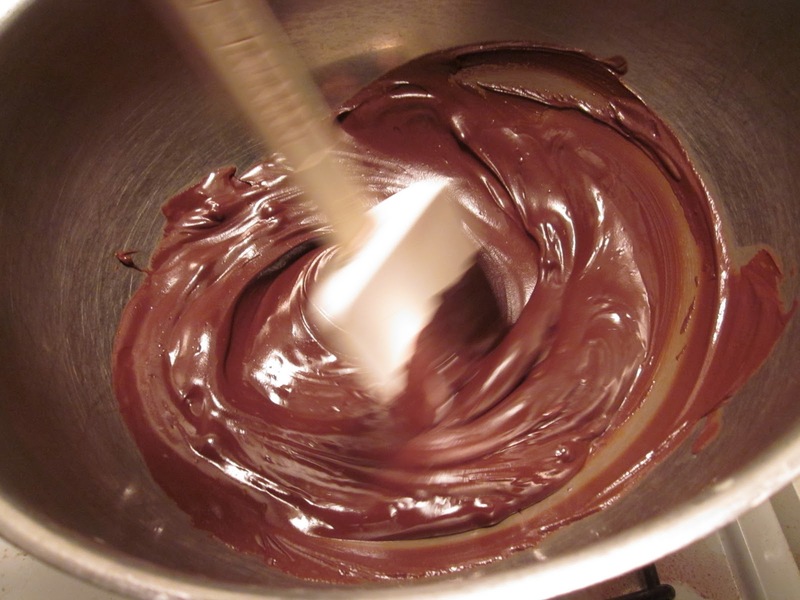 Whisk till smooth. Allow to cool, then place in the refrigerator for at least two hours. Roll half-teaspoon sized balls in your hands as quickly as you can. 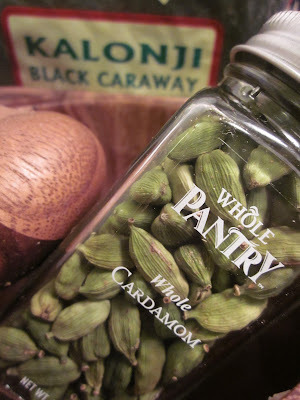 Roll in unsweetened cocoa and another dash of cardamom. Place on a baking sheet lined with parchment paper and refrigerate for several hours before serving. 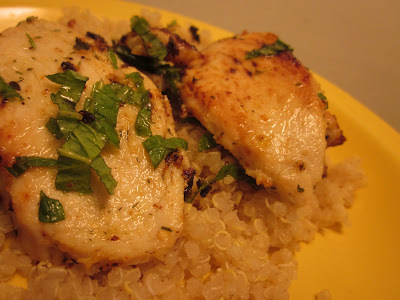 When a friend excitedly replied to a post about my lemon chicken recipe, I realized that I should have specified, it's more like chicken with lemon. I am certain that the term 'lemon chicken' brings to mind a certain dish. Mine is not that...I don't think, but it is tasty and easy. While my pot of quinoa steamed in organic chicken broth, I thinly sliced boneless, skinless chicken breasts and browned them with a pat of butter, a splash of olive oil, and some minced garlic. When the chicken is almost cooked, squeeze in the juice of one meyer lemon. Season with sea salt, freshly chopped oregano and freshly chopped dill and cook till the chicken begins to brown and crisp. Serve over a bed of quinoa and some freshly chopped mint leaves. One of the Christmas presents I most appreciated: a bag full of different kinds of flour. 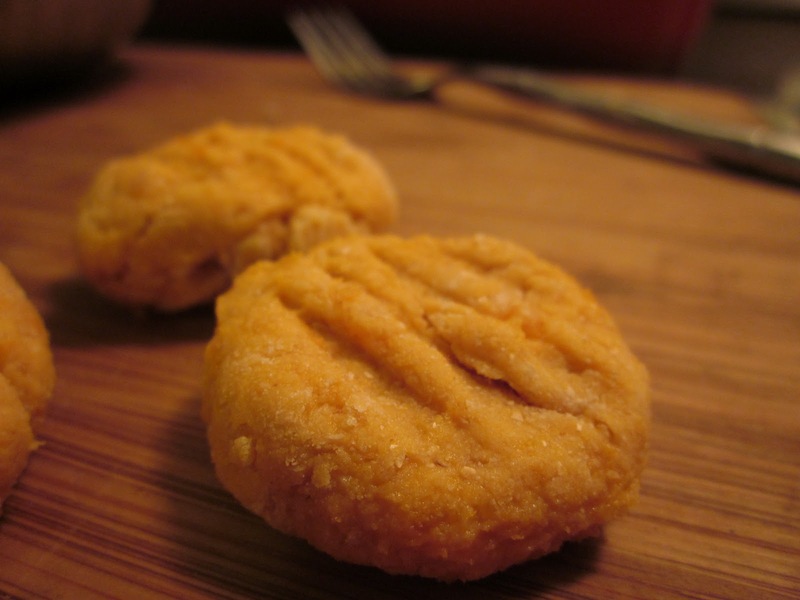 Barley flour, coconut flour, corn flour, garbanzo flour and coconut flour. In other words, a culinary challenge. Since my husband graciously took the boys for a bit this evening, I cranked up Journey, cooked dinner in peace, and went to town with my bag of garbanzo flour, using the recipe on the back as a starting point for falafels. Mine didn't really resemble the crispy golden orbs I loved from a falafel stand in Berkeley; they were more like patties. But they were tasty and I will definitely make them again. Mix all ingredients together and let rest for 10 minutes. Heat oil in a flat-bottom pan and place teaspoons of the batter in. Cook till browned. Flip and brown the other side. 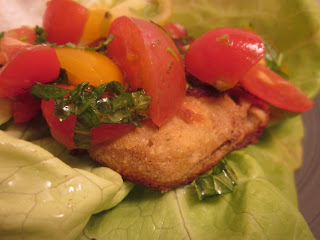 I had some lettuce from my High Ground Organics CSA box, so I skipped the traditional pita. Serve on a leaf of lettuce with a topping of fresh tomatoes and fresh mint tossed with sea salt and olive oil. On Christmas Eve we played a version of Family Feud at the dinner party my mom hosted. When it went to the sudden death round, she hand-picked the questions for each player until one team couldn't answer. Totally unfair. The final question for me was: name foods that most people have never tried. Everyone on both teams chuckled, "she has no idea what most people have never tried." But I did it. Of course, I adopted the mindset of what would some of my friends in the Mid-West say to that question. Sorry, guys. Face it, you don't live in the most culinarily adventurous area; it's one of the reasons I fled and returned to California. Final answer = caviar. I am proud to say that though it was a challenging topic for me, since I eat just about everything, my team "The Fat Garfield Team" (yes, my 8-year-old picked our name) prevailed. 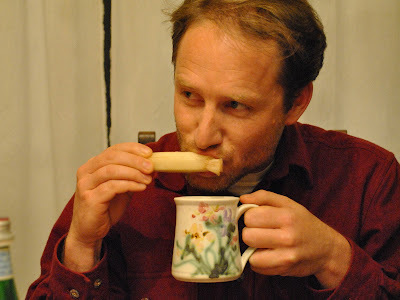 In the vein of adventurous eating, I want to take a walk down my culinary memory lane and run down the list of my top ten from 2011, things that made my tastebuds sing. Enjoy! 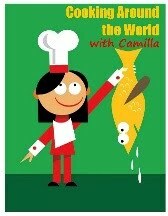 Looking forward to even more fun in the kitchen in 2012. (10) Chocolate mousse with a licorice twist. Yes, please. That's what my Strega Chocolate Mousse tasted like. I served them in teeny, tiny cups because the flavor packed a punch. 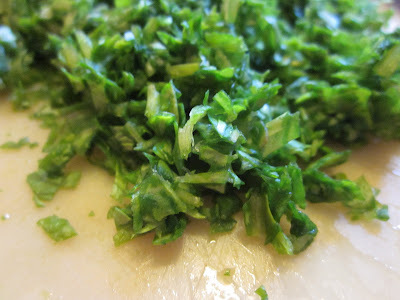 (9) When I received bunches of green garlic in my CSA box from High Ground Organics, I was intrigued. I had never tried, much less cooked with, green garlic. I finally came up with a Green Garlic Gazpacho that was a delicious Spring treat. I hope that I get some in my boxes come next Spring. I will definitely be making this again. 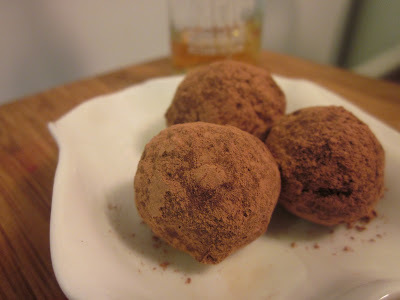 (8) Chocolate truffles are my go-to when I want something chocolate-y. The absolute favorite version I made this year, though, was my Bee Pollen Truffle with fennel pollen inside and bee pollen on top. Yes, they are as decadent a treat as that sounds. 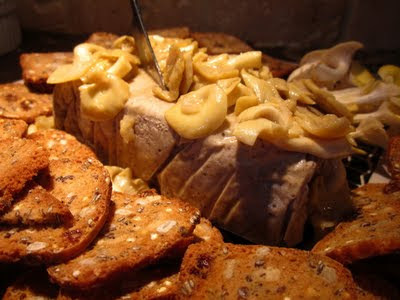 (7) No geese were harmed in the production of my Triple Mushroom Pâté that I whipped up for my husband's birthday dinner last April. The 'Fungi Feast for My Fun-Guy' gave me the opportunity to visit a local mushroom farm. This was a fairly involved recipe, but the results were well worth it. 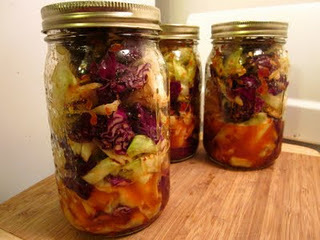 (6) I've made my own pickles before, but I've never fermented cabbage, Korean-Style. This year I tried my hand at making kimchi and it was such a hit that, first, there is now a jar of homemade kimchi always ready to go and, second, (I am most proud of this) a good friend of mine who previously didn't eat cabbage is a convert. Yipee. (5) Years ago I was opposed to anything pink. But being the lone female in the testosterone land called the Mann Clan, I think I've begun to embrace the traditionally girly color. I even did an entirely pink dinner for a friend's birthday with all things beet. 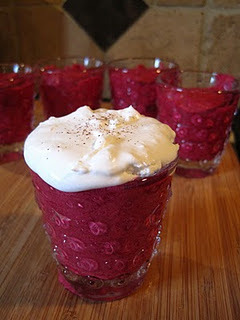 The dessert I made: Spiced Beet Mousse. It was a treat for the eyes as well as the tongue. 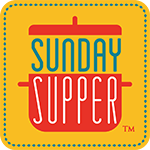 (4) When my 9-year-old and I were working on the Thanksgiving menu, he added some things that made even our traditional fare more fun. 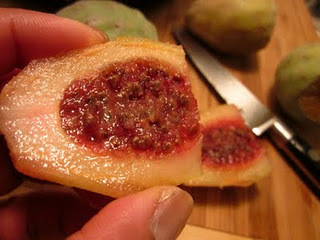 Case in point, Riley asked if I could buy some prickly pears and could I add prickly pear to my cranberry sauce. Yes. And, yes. Love it! The Prickly Pear-Cranberry Sauce was the perfect companion to our roasted quail. Nice call, Riley-ball. (3) This was so tasty that I made it multiple times throughout the months of November and December when leeks and kale were a constant in my High Ground Organics CSA box: Potato Salad with Caramelized Leeks and Kale. 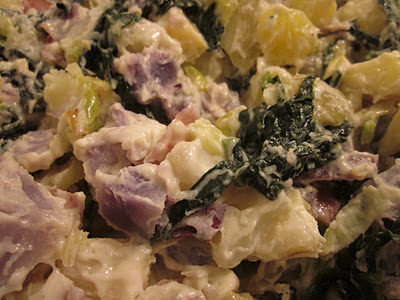 It's not your typical potato salad, but each time I served it, it disappeared quickly. (2) Chestnuts roasting on an open fire.... Though that is one of my favorite Christmas carols, peeling chestnuts is one of my least favorite kitchen chores. 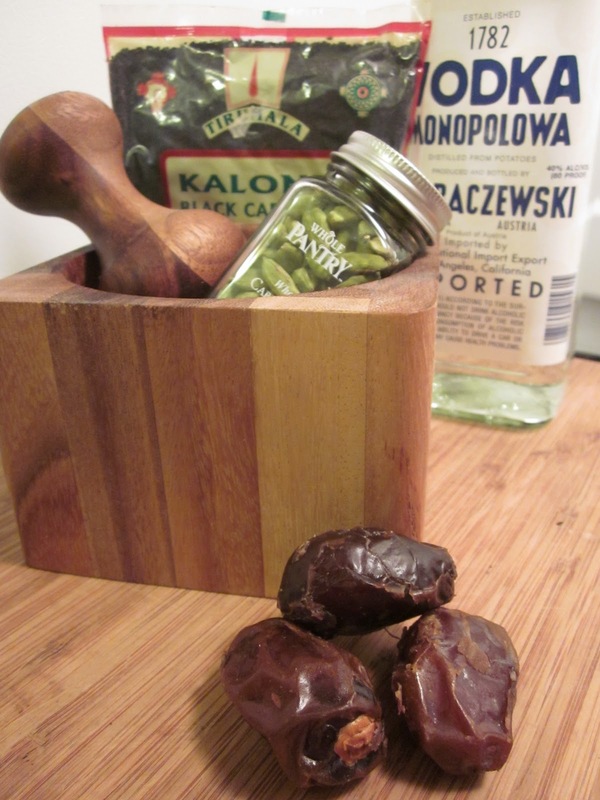 So, when I see roasted and peeled vaccum-packed chestnuts at Trader Joe's, I stock up. 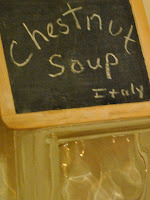 I used a bunch in a soup I served on Christmas Eve: Creamy Chestnut Soup. Two spoonfuls in, my husband asked if I wrote down the recipe. Sure. "No, really, write it down." Okay, fine. Drum roll, please. And my absolute top pick of 2011: Rhubarb Liqueur. Cin cin. It was so easy, except on my patience. But I will be making a much bigger batch of this next year. Hope you enjoyed my adventures and continue to follow along next year. I was looking for a quick, but unique liqueur to make for a birthday dinner in early January. I found it: thibarine, a date liqueur from Tunisia, is infused with caraway and cardamom. Oh, my! Even the brief ten-day decant seems too long. I started with a gluten-free potato vodka. 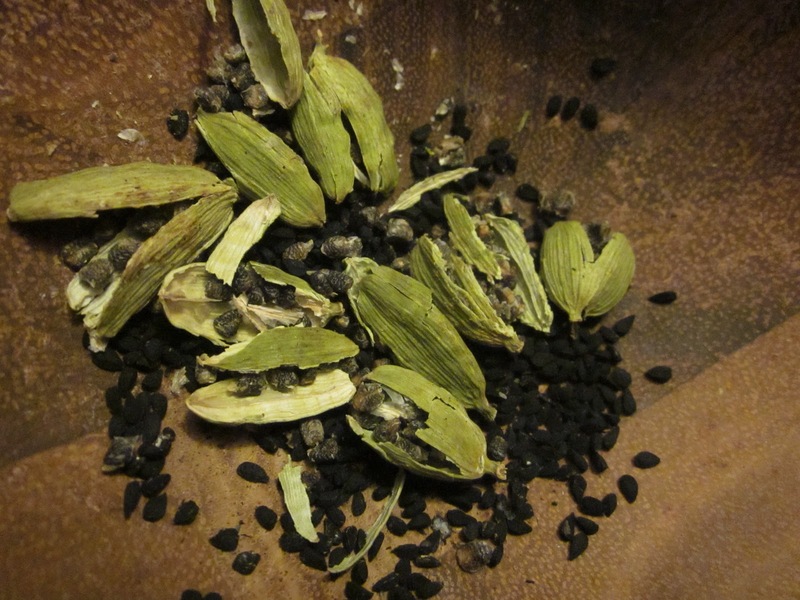 I crushed 1 t organic green cardamom pods and 1 t black caraway seeds in a mortar then placed all of that with 1 lb deseeded medjool dates in a small saucepan. 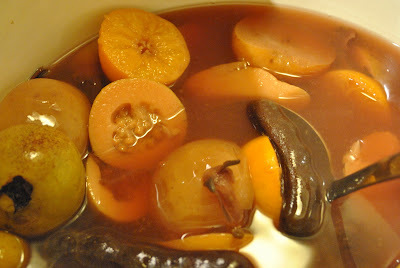 I covered it with vodka - just enough to submerge the dates - and heated the mixture until it just began to steam. I placed all of that plus the remainder of the vodka in a large glass container. Cover and let the mixture age in a cool place for 10 days. Stir once or twice. Strain the liqueur into a colander over a large bowl. 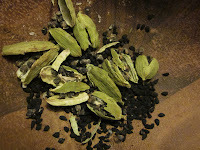 Discard fruits and spices. 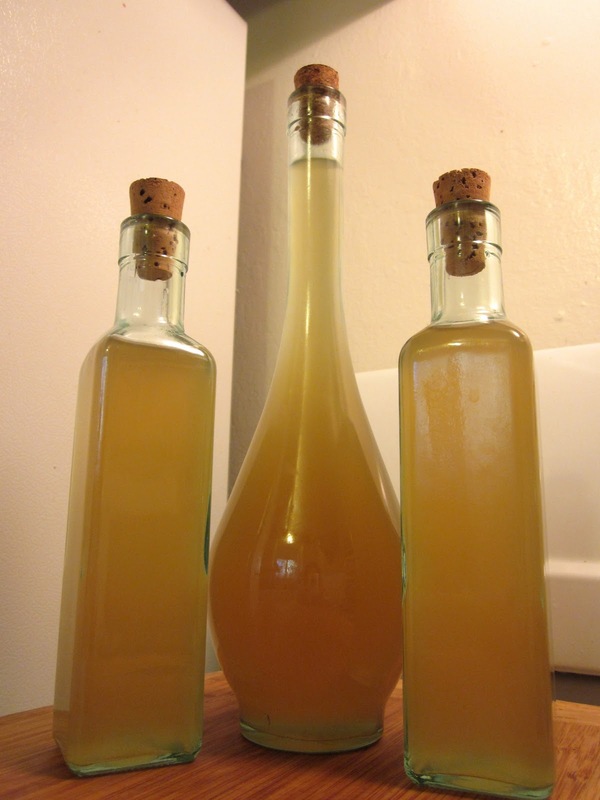 Strain through cheesecloth and pour into bottles. I'll let you know in a couple of weeks how it turns out, but how can you go wrong with these ingredients? 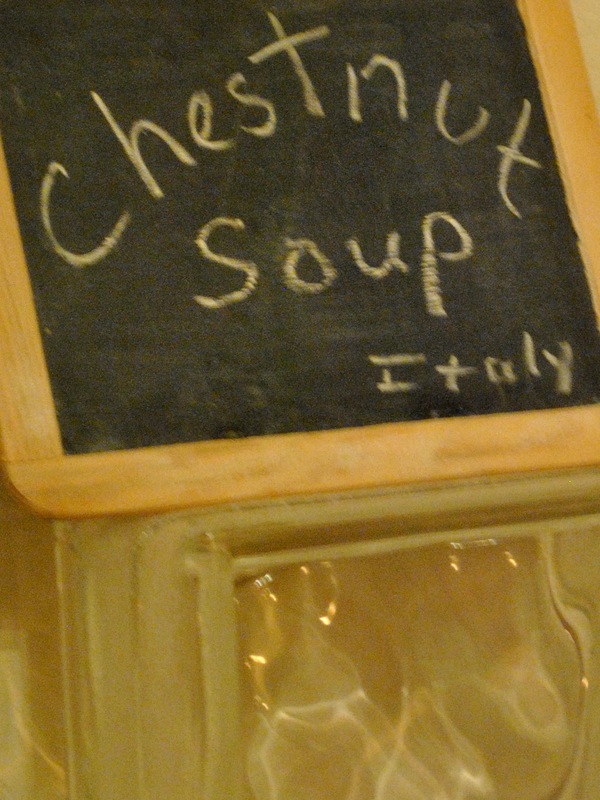 When my mom asked me to bring a soup and a vegetable for her international Christmas eve dinner, I told her I'd make a chestnut soup. What country is that from? Ummm...Italy. Really? Well, that's where I first saw what a chestnut looks like fresh off the tree - seemingly inpenetrable balls of threatening brown spikes which then reveals the shiny, still ridiculously difficult to crack inner shell. It's where I became enamoured with the Italian sweet Marron Glace (candied chestnuts). The bags of chestnut flour I buy, when I can find them, are imported from Italy. Yes, really. In a large soup pot I caramelized diced onions, shallots, and celery with fresh rosemary. When they started to caramelize, I added roasted and peeled chestnuts - thank goodness for Trader Joe's vacuum packed ones! - and cooked them for about ten minutes, stirring constantly. Then I topped all of that with organic chicken broth and added sliced brown crimini mushrooms and fresh bay leaves, bringing it to a boil and simmering until the mushrooms were cooked. I seasoned the soup lightly with sea salt and fresh pepper, finishing off the soup with some heavy cream. Remove bay leaves when serving. I have always known that the day after Christmas is Boxing Day in the UK, Australia, and other Commonwealth nations; what I didn't know was what that meant. Honestly, I despise that sport, so I never took the time to read up on the holiday. Today that changed when a friend, on a social networking site, wrote about Boxing Day. When I realized that it's actually a day about goodwill and generosity - when wealthy people in Britain would give a box, with a gift, to their servants - I decided we would honor that with a British dish for dinner. Okay, you know me, it's more like a British-inspired dish. In the end, my cottage pie would probably be unrecognizeable to a real Brit. Oh, well. It was delicious. I learned, in my recipe hunt this afternoon, that the term 'cottage pie' is used when the meat inside is beef and 'shepherd's pie' refers to a lamb-based dish. 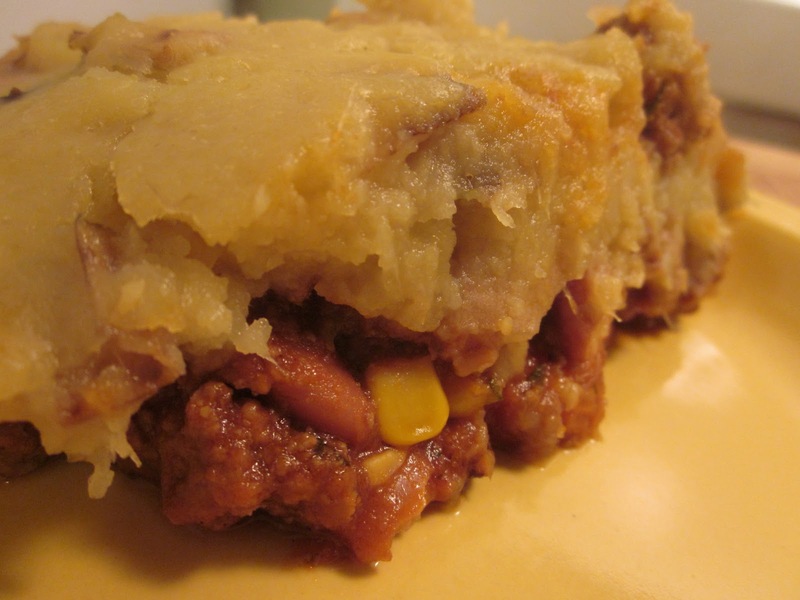 The meat pie is topped with a potato crust and baked till the peaks are slightly browned. Not having any potatoes, I opted for a mashed sweet potato crust. I warned you that mine was less-than-traditional. Cube sweet potatoes, boil in salted water until tender (about 20 minutes). While the sweet potatoes are cooking, melt 2 T butter in large frying pan. Sauté garlic in butter until tender over medium heat. Add ground beef and sauté until no longer pink. Season with salt, pepper, ground cumin, and ground curry powder. Add balsamic vinegar. Add tomato sauce and cook, uncovered, over low heat for 10 minutes, adding more tomato sauce as necessary to keep moist. Add the vegetables after the meat has initially cooked. And cook till fork tender. 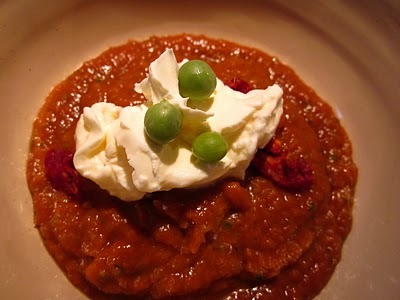 Mash sweet potatoes in bowl with remaining butter, season to taste. Place beef mixture in a baking dish. 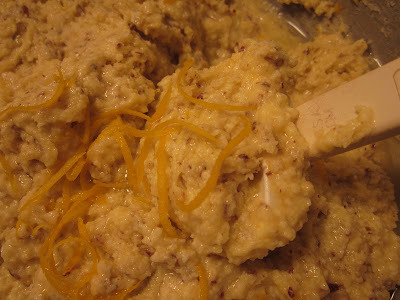 spread mashed sweet potatoes on top, making rough peaks with a fork so that there are peaks that will brown nicely. You can use the fork to make some designs in the potatoes as well. Cook in 400 degree oven until bubbling and brown (about 30 minutes). Broil for last few minutes if necessary to brown some more. I simply halved the fruits though some people cut them into bite-sized pieces. Then I placed all of the ingredients into a large soup pot and brought it to a boil. I reduced the heat and simmered for 30 minutes. It was very disconcerting to have all of these natural ingredients in a pot and, yet, my kitchen smelled like a piece of red hot candy. To serve, I had Jake trim and make swizzle sticks out of some sugar cane rods. 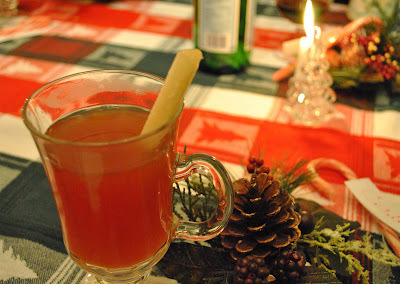 Ladle ponche into mugs and drop in a sugar cane swizzle stick. For adults, top with a floater of rum if you'd like! Thanks for the inspiration, girlichef. Cheers and Feliz Navidad. 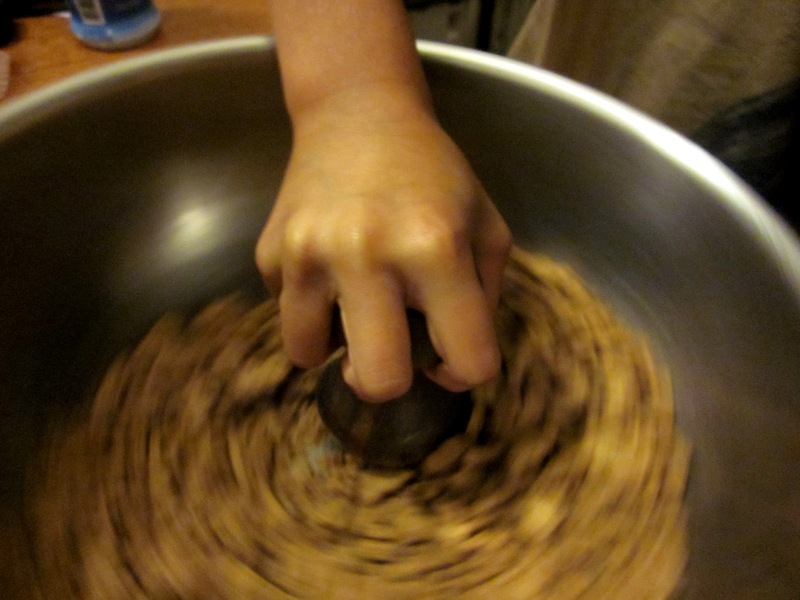 Place all the dry ingredients into a mixing bowl. Add the wet ingredients and stir till just moistened. Cook in your waffle-maker according to its directions. 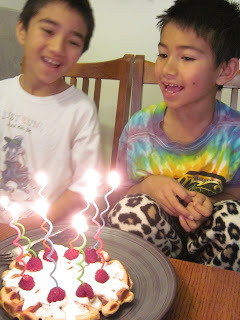 Wishing my fiesty, sweet boy who lives up to his name - Dylaney which means 'the challenger' - the best of birthdays! Now off to pick number two: a hike through Point Lobos. Then returning for chicken noodle soup. Not surprisingly, he plans Dylan Day around the meals. That's my kid! Okay, so we're not Jewish. But we are attempting to raise socially-aware citizens of the world who are not just tolerant of, but are knowledgeable about, religious and cultural differences. So, we celebrate Hanukkah. Riley wanted a menorah as soon as he learned about Hanukkah in kindergarten; and every year I make latkes. I read that the secret to making the perfect latkes - golden on the inside and crispy on the outside - is the starchiness of potato. The best, supposedly, are the baking russets; the worst are boiling potatoes. I opted to use what I had: Yukon golds. They fall in the middle of the starchiness scale. This year I changed it up a little by adding shredded carrots, too. Delicious! Mix together shredded potatoes, carrots, diced onions and shallots, sea salt, freshly ground pepper, and beaten egg. Heat oil in a large flat-bottomed pan. When the oil is hot, spoon 2 tablespoons of the potato mixture per latke into skillet, spreading into 3-inch rounds with a fork. Cook until undersides are browned, about 5 minutes. Turn latkes over and cook until the other sides are browned, about 5 minutes more. Transfer to paper towels to drain and season with salt. 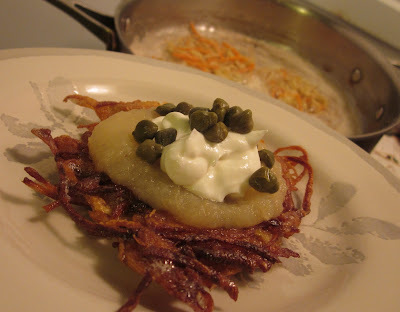 Slather with applesauce, serve with a dollop of sour cream, and top with capers. 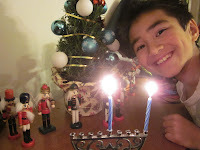 After dinner we lit Riley's menorah and played with Dylan's dreidel. Jake won all of the golden coins. There's always tomorrow. As Christmas is this weekend - yes, really! - I decided it was time to filter and bottle my attempt at rhubarb liqueur. Kinda like limoncello, but with rhubarb. 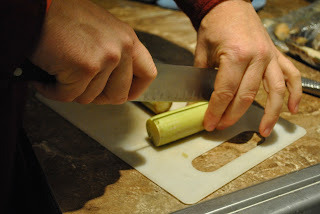 Some changes: I did not strain out the rhubarb after 4 weeks, but left them in for the 3-month aging process. Now I have some potent pieces of rhubarb and am thinking about what to do with these. Candy them and make some really festive panetone?!? Also my liqueur never took on the rosy red hue I wanted. Then again, my stalks weren't really red either. BUT we gave it a sip this morning and it was delicious! Next year I'll have to make more! This year, I hope two of my friends will enjoy it. Months ago when my friend Pia started planning her son's 5th birthday party, he came to Aunt Camillala (that's not a typo, that's what he calls me) and requested a Go, Dog, Go! cake. Jake and I have baked the Garneau boys' cakes since they first had parties. My job is baker; Jake's job is cake-architect. If you think that "cake-architect" must be an exaggeration, well, then you haven't seen his cakes. Go, Dog, Go! That didn't sound so hard. "...with a green dog in a canon." Okay. 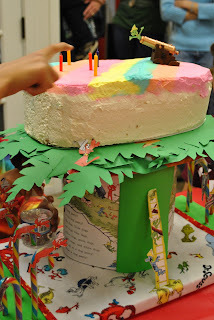 Two things we ensure about these birthday cakes: (1) they have cool details that match the party theme and, most importantly, (2) they are fresh and delicious. 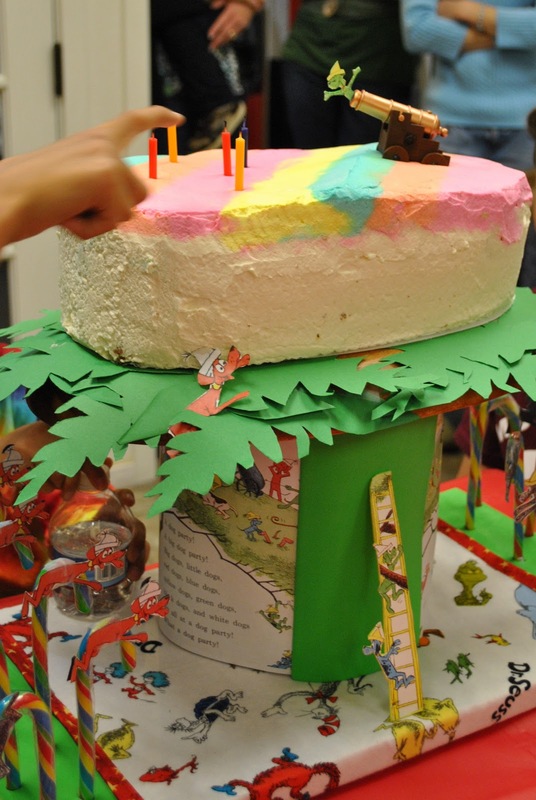 Though, truth be told, as we were cutting out and backing dogs and assembling this cake in a tree, Jake exasperatedly said, "Cam, it's called a sheet cake from Safeway. Why are we doing this?!?" My love, we are doing this because you cannot simplify. As I mentioned, I'm the baker. I decided to make a meyer lemon-almond cake, filled with homemade raspberry preserves, and frosted with a barely sweetened whipped cream. Preheat the oven to 350 degrees. Butter baking dish. Cream the butter and sugar together until light and fluffy. Add eggs one at a time, beating well between each addition. 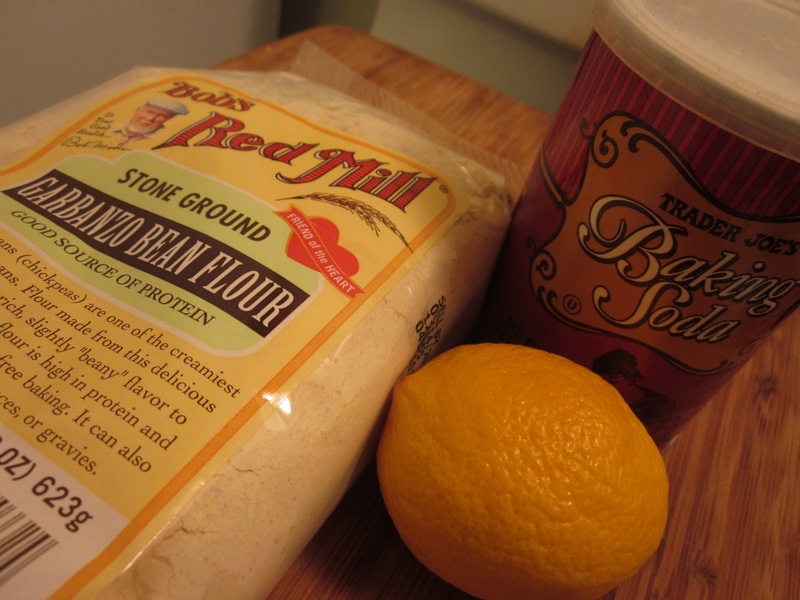 Add flour, ground almonds, and baking powder, folding into the batter until just moistened. Mix in zest and juice. Pour into prepared baking dish and bake till the cake is lightly browned and firm to the touch, approximately 35-40 minutes. Cool slightly. 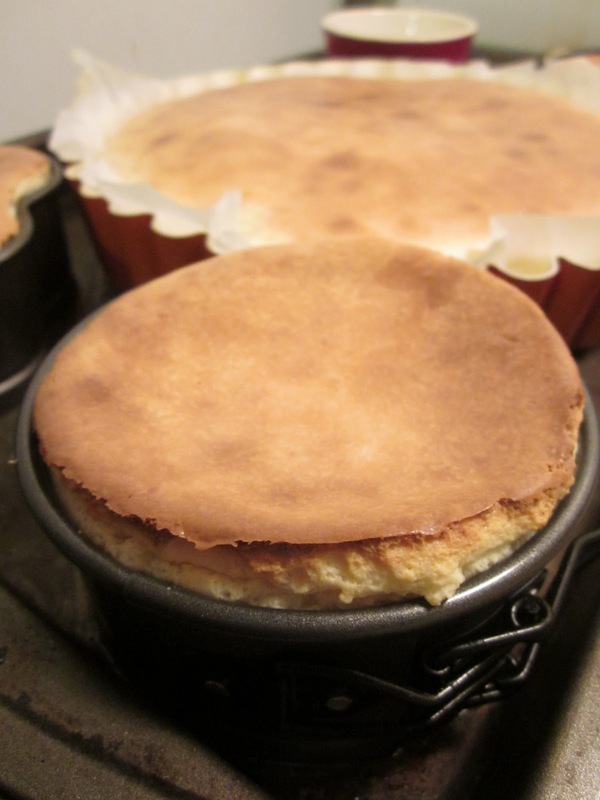 Using a knife, cut around the pan sides to loosen cake. Invert cake and cool completely. Place all ingredients in a medium saucepan. Sitr over medium heat until the mixture boils and thickens. Cool. Cover. Chill until cold. 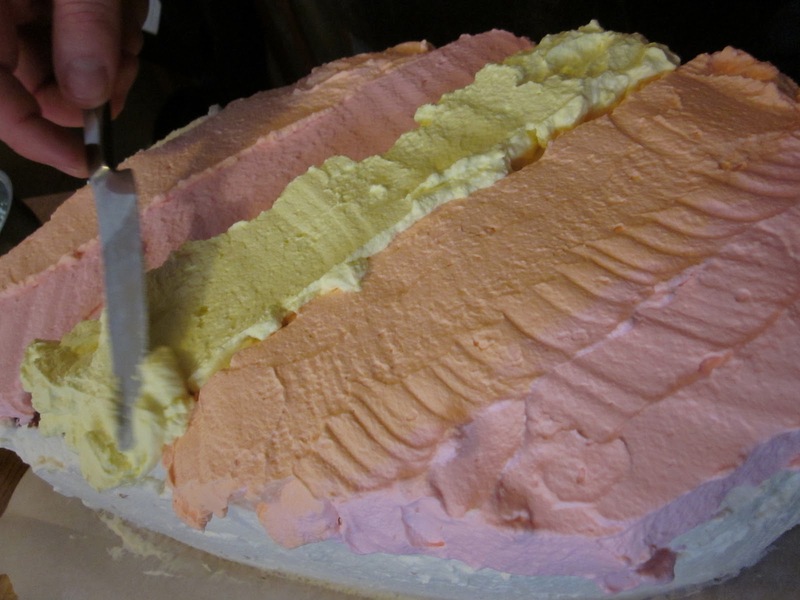 Spread between cake layers. Organic heavy whipping cream with a dash of pure vanilla and a scant sprinkling of organic granulated sugar. I joked about the frosting: "oh, I made the dye. The pink is from beets, the orange from carrots, the yellow from golden beets, and the blue from a smurf." [silence] "No, I actually did use food coloring!" Han Solo in ... Chocolate! 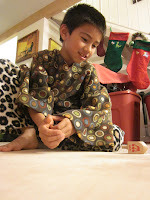 Almost two years ago one of my favorite bloggers - Rook No. 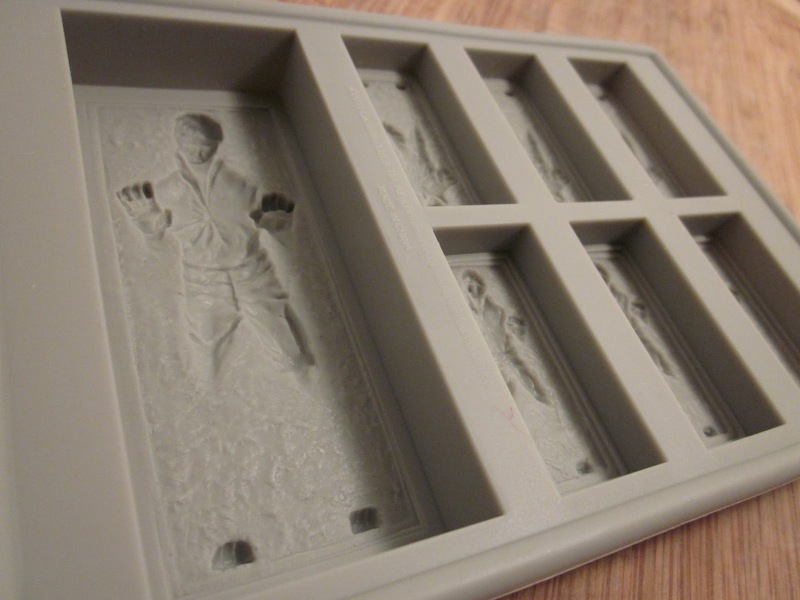 17 - posted about making her own mold from a Han Solo in carbonite toy. I never got around to (1) finding a Han Solo in carbonite toy of my own and (2) figuring out how to make a mold with Silicone Plastique. 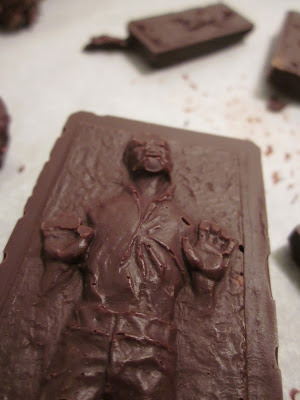 But I've always enjoyed the idea of this treat: Han Solo frozen in a block of carbonite, I mean dark chocolate. I found some pre-made chocolates at ThinkGeek for $11.99; they also had a silicone mold to make ice cubes or chocolate for $9.99. No brainer - twelve dollars for something that we could enjoy once or ten dollars for something we could use multiple times. Done. I ordered it and if just arrived. Time to temper some chocolate! This is going to make some of my favorite Star Wars fans a very nice stocking stuffer. 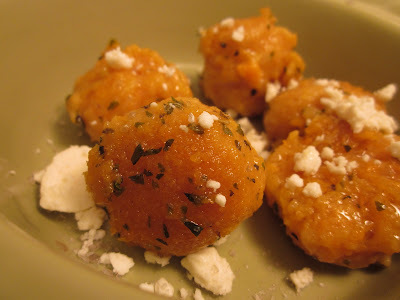 With some leftover roasted sweet potatoes in my fridge, I decided to make a sweet potato gnocchi for dinner. Most people roll their gnocchi dough into a thick straw and cut the gnocchi; in Italy I was taught to hand-form them, so mine look less uniform. For this batch I used 3 C of sweet potato puree. Add two pats of butter, one beaten egg, then mix in flour, slowly, until you get a medium (not stiff, but not too sticky either) dough. Usually I add about 3/4 C by the time I'm done. Using about 1/2 teaspoon of dough, with floured hands, I form a ball and flatten it slightly with fork tines. I cook the gnocchi in chicken stock for added flavor. Once your broth - or water - has come to a boil, gently drop the gnocchi in the pot. They will float when they are cooked. Because this is a fresh pasta, it cooks very quickly, maybe a minute or two. 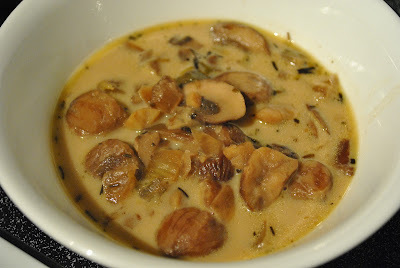 Remove the gnocchi with a slotten spoon and place in a colander to drain a bit more. Jake had a suggestion, so I gave it a whirl. I melted butter and dried oregano in a saucepan. Then I placed the gnocchi in the butter and let them brown slightly. 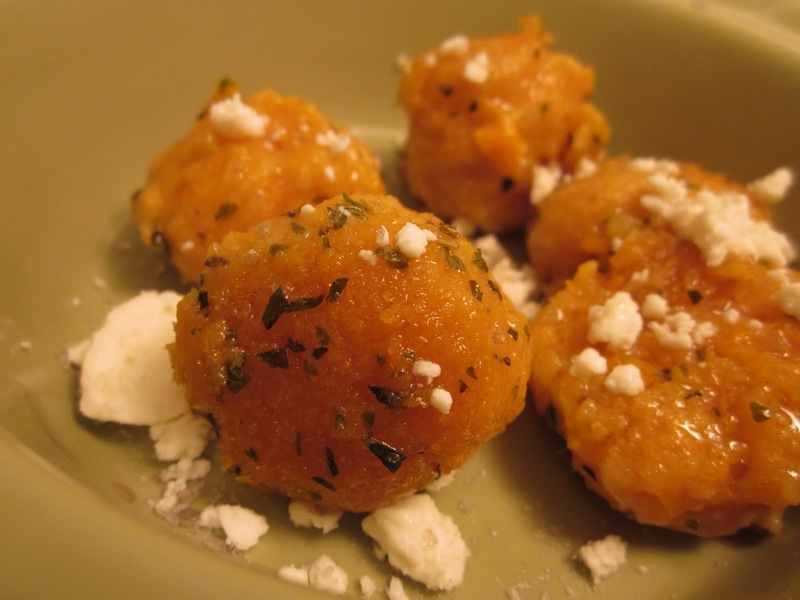 I served them simply - with a sprinkling of sea salt, drizzled with olive oil, and topped with crumbled feta cheese. Beat cream cheese in large bowl until fluffy. Beat in sugar. Beat in eggs 1 at a time. 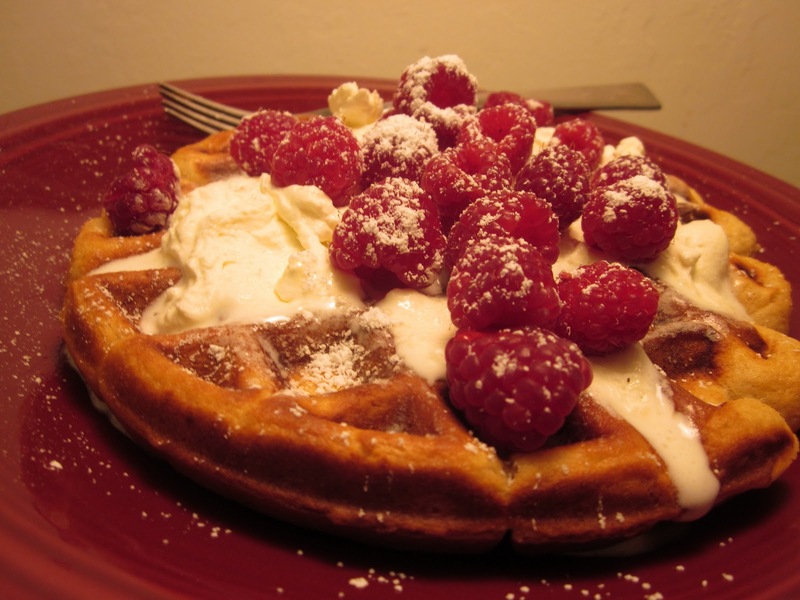 Mix in sour cream and vanilla. 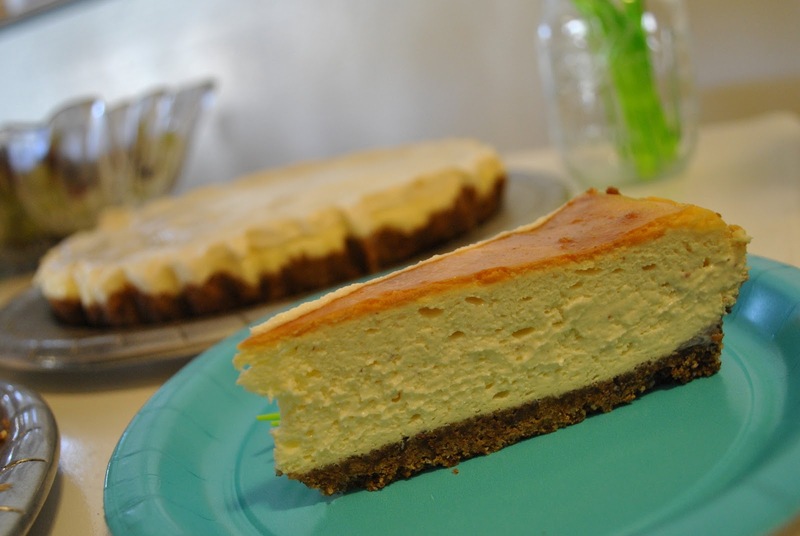 If you would like to top the cheesecake with a sour cream topping, beat together 1 C sour cream, 1 T vanilla, and 1 T organic sugar. 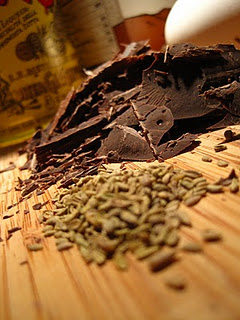 Spread this over the cheesecake and bake in a 350 degree oven again for 5 minutes. Transfer cake to rack. Run knife around pan sides to loosen cake. Cool completely. Remove foil from pan sides. Cover cake and chill overnight. (Can be made 2 days ahead. Keep refrigerated.) Remove pan sides to serve. For Dylan's birthday celebration, he originally asked for a baked alaska but I disuaded him because I didn't want to be in the kitchen making a last-minute dessert while the party was going on. He finally decided on cheesecake. It was then that, fourteen years together and two dozen cheesecakes later, the love of my life finally copped to an awful secret: he doesn't like my funky, fruit-laden cheesecakes. I had been thinking of a cranberry-lemon cheesecake; he told me that cheesecakes should be 'plain and white.' So I took it to my facebook wall and, in horror, realized that I was in the minority. Even some of my closest friends, with what I consider sophisticated palates, agree with my husband - plain and white. Ugh. Thankfully my child doesn't agree. Dylan requested an eggnog cheesecake with a gingersnap crust. Perfect! 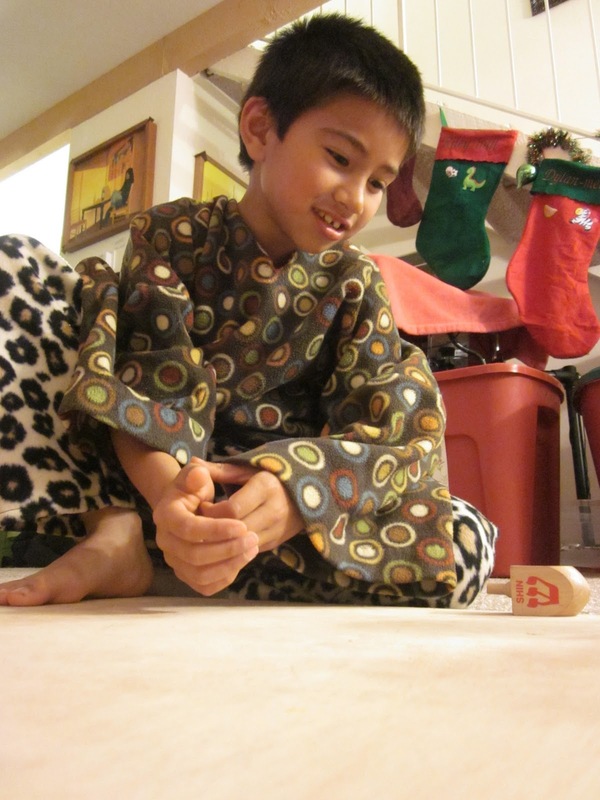 I put his crushing skills to work and he helped pulverize the lemon-ginger cookies from Trader Joe's. Position rack in center of oven and preheat to 350°F. Beat cream cheese in large bowl until fluffy. Beat in sugar. Beat in eggs 1 at a time. Mix in eggnog and vanilla.